One of the brightest points of light in the December midwinter darkness of Stockholm is Nobel Prize Week, culminating in the Nobel Prize Banquet at the iconic Stockholm City Hall. The Nobel Prizes have been awarded for over 100 years are considered to be the most prestigious in the world. The Nobel Prize week with all of the associated events has a special meaning for us at MinnesotaSwede, with some of our roots in Life Science as well as in our work showcasing our beautiful capital city of Stockholm. Did you know that at least 10 former Minnesotans have won Nobel Prizes as well? Alfred Nobel was a great Swedish industrialist in the 1800s´who held several hundred patents for many innovative inventions, including dynamite. In his last will and testament, he declared that his great estate be established as a fund for annual prizes for “those who….shall have conferred the greatest benefit on mankind”. From December 5th to December 8th, the days in Stockholm are filled with press conferences, seminars and lectures by the Nobel Laureates. 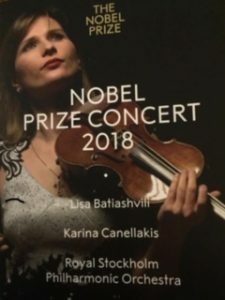 On December 8th, a Nobel Prize concert is held in the Stockholm Concert Hall to honor the Nobel Laureates. 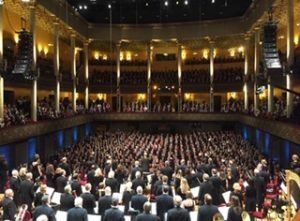 On December 10th, everyone returns to the Concert Hall where the Nobel Prize Award ceremony commences, and the laureates receive their prizes from His Majesty King Carl XVI Gustaf of Sweden. 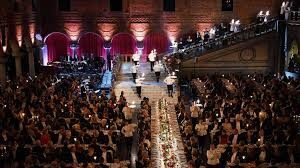 In the evening, the banquet of all gala banquets takes place in Stockholm City Hall, where 1,300 guests and dignitaries dine in a 3 course meal with the Nobel Laureates and the Swedish Royal family. …but what about those Minnesotans?